Most debris flows occur in valleys of area smaller than 50 km2. While associated with a valley, debris flow is by no means a full-valley event but originates from parts of the valley, i.e., the tributary sources. We propose that debris flow develops by extending from tributaries to the mainstream. The debris flow observed in the mainstream is the confluence of the tributary flows and the process of the confluence can be considered as a combination of the tributary elements. The frequency distribution of tributaries is found subject to the Weibull form (or its generalizations). And the same distribution form applies to the discharge of debris flow. Then the process of debris flow is related to the geometric structure of the valley. Moreover, viewed from a large scale of water system, all valleys are tributaries, which have been found to assume the same distribution. With each valley corresponding to a debris flow, the distribution can be taken as the frequency distribution of debris flow and therefore provides a quantitative description of the fact that debris flow is inclined to occur at valley of small size. 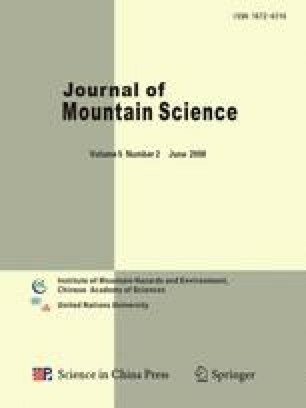 Furthermore, different parameters appear in different regions, suggesting the regional differentials of debris flow potential. We can use the failure rate, instead of the size per se, to describe the risk of a valley of a given area. Finally we claim that the valleys of debris flow in different regions are in the similar episode of evolution.